POSTED March 27, 2019 1:18 p.m.
VERNON COUNTY - Vernon County Friends of Fair Maps held a forum at the American Legion Taphouse #138 in Viroqua on Tuesday, March 12. The discussion focused on the effects of gerrymandering on Wisconsin congressional elections. The event was co-sponsored by the League of Women Voters, and the Fair Maps Coalition. Almost 25 citizens gath-ered to listen to Joe Heim, Professor of Political Sci-ence/Public Administration at UW-LaCrosse, and Jay Heck, Executive Director of Common Cause in Wiscon-sin, discuss gerrymandering and the upcoming vote on a Fair Maps resolution in Vernon County. This vote will take place in the spring election to be held on Tues-day, April 2. If the resolution passes, Vernon County will be one of seven counties where such a resolution has passed. In other counties where such a resolution has passed, it has garnered up-ward of 70 percent approval. 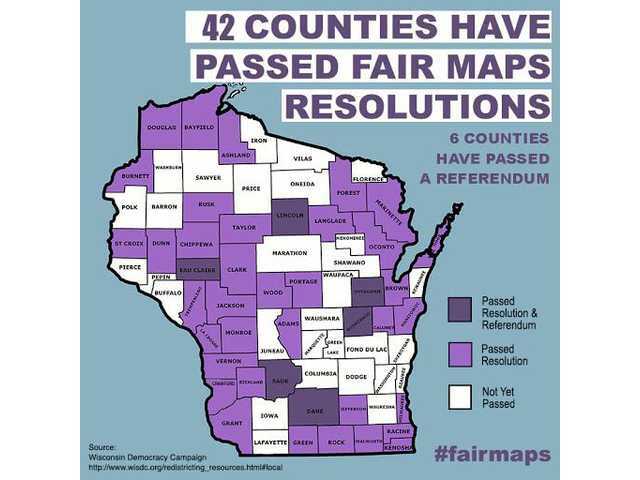 In all, 42 of 72 of Wis-consin’s county boards have passed Fair Maps resolu-tions, with the Crawford County Board being the most recent. Joe Heim told participants that he is neither a Republican nor a Democrat, and that he had been in-volved with redistricting issues for a long time. Heim said it used to be difficult to interest citizens in the dry and complicated topic of redistricting, but that has changed. Heim said that increas-ingly voters think that it is wrong for legislators to pick their voters, versus voters picking their legislators. He said that of the 435 legisla-tive seats in Wisconsin, only 50-70 of them are truly competitive - due to creation of “safe seats” as a result of partisan gerrymandering. Heim says that voter sup-pression has a direct, nega-tive impact on the legitima-cy of our governments. Voter turnout is constantly decreasing, and trust in government is declining in national polls. “In the 2012 election, af-ter the current legislative seats were redistricted, Democrats and Republicans each got 50 percent of the vote,” Heim pointed out. “Despite that, the Republi-cans picked up five seats, and the Democrats picked up only three. He went on to point out that in the November 2018 election, Democrats had won all statewide elections by a 52 to 48 percent mar-gin. But the results in the state legislative elections did not reflect these percentages. • claim that there is no way to measure partisan discrimination. Back in 2011, Republi-cans redrew Wisconsin’s state legislature maps and heavily gerrymandered them to benefit their own party. To do so, they used a time-tested technique known as packing and cracking. They “packed” many Democratic voters into just a few districts that the party would win overwhelmingly, to dilute their electoral strength elsewhere. Then they “cracked” remaining Democratic voters elsewhere in the state, spreading them out across various districts to try to ensure the GOP would have the advantage in most of them. University of Chicago law professor Nicholas Stephanopoulos and politi-cal scientist Eric McGhee had developed a metric called the “efficiency gap” — a way to calculate how many votes for each party were “wasted” by a particular map, through packing and cracking. So in the Gilll v. Whit-ford suit, the plaintiffs — 12 Democratic voters in Wisconsin — proposed that the courts limit partisan gerrymandering based on the efficiency gap. And they suggested that if a party gets a wasted-vote advantage of more than seven percent of the total vote in the state, that’s unconstitutional. In the Gill v. Whitford case, the very expensive software used in redistricting by the Republicans was also at the very center of the lawsuit. Heim said that with the current divided government in the state, with a Republi-can legislature and a Demo-cratic governor, the redis-tricting after the 2020 cen-sus will be a politically fraught process. He said that it will likely lead to the courts once again having to draw the maps. Jay Heck of Wisconsin Common Cause talked about the Iowa Model for nonpartisan redistricting, and the bipartisan support in the state around the issues of reducing money in elec-tions, fair maps, and making it easier to vote. Heck explained that the U.S. conducts a census eve-ry 10 years. He said that for the last 50 years, every time there was a new census, Wisconsin had divided gov-ernment. Heck reported that Wis-consin State Assembly Speaker Robin Vos and State Senate Majority Lead-er Scott Fitzgerald had led the redistricting effort in complete secrecy, in a pro-cess that took over 100 hours. Heck said that what was done in Wisconsin in 2011 was part of a ‘master plan,’ that was also implemented in Ohio, Pennsylvania, Michigan and North Caroli-na. He said that in the 2009-2010 legislative season, when Democrats controlled the legislature and the Gov-ernor’s office, the party had missed a key opportunity to adopt the Iowa Model for nonpartisan redistricting. Heck explained that with the Iowa Model, a nonparti-san task force draws the maps, and then the legisla-ture is given the opportunity for a simple ‘yes-no’ vote without opportunity to offer amendments. If the redrawn maps are voted down, then the task force accepts input, and offers another set of maps for another ‘yes-no’ vote. Heck says that the Iowa Model does not mandate that there be competitive elections. In Iowa, he ex-plained, there are mixed results, with some elections becoming more competitive after redistricting, and some less. Part of the reason the Io-wa legislature adopted their model was to control costs. They were especially con-cerned to avoid litigation, which drives the cost up. Heck pointed out that Governor Evers has included money in his proposed budget to enact the Iowa Model of redistricting, which he believes the Re-publicans will withdraw from the budget they pass. Under Evers’ plan, the Leg-islative Reference Bureau will draw the maps, and the legislature would vote on it. Heck says that redistrict-ing is one of the things that Speaker Vos and Majority Leader Fitzgerald hold most near and dear. He said that he expects Vos and Fitzger-ald to oppose Governor Evers’ plan, and for Evers to then veto the budget the legislature sends him. • vote in the State Su-preme Court election on April 2. Heck encourages all con-cerned citizens to talk to their friends, family and neighbors, and ask them if they support maps that are fair, having a real choice in elections, and having real competitive elections.